Outsyder Gaming went on hiatus a few weeks ago because I was devoting all of my time to my wife's health and had no time or energy to write. Sadly, she passed away on March 23rd. She is better now (no TTP, no pain, no GvH disease), but I am not... and although I've never really thought of myself as an escapist gamer, I'm starting to think that my perspective is changing/has changed. I'm finding myself grasping for anything to help keep my mind off of things, and gaming has always been an outlet for otherwise unspent energy. So Outsyder Gaming is coming back online... probably slowly at first, but it is coming. I needed this creature to fill a niche in the campaign, in which my brother created a character (the ghostly mage) and I added to his story (that he was being controlled by something more sinister), and then I realized that in order to wrap things up so that Matt could have complete control over the story, I needed to wrap up that plot line. I briefly considered using a mind flayer, but I just couldn't bring myself to use such an obvious villain. "Ho, hum, someone's doing some mind controlling, so there is probably a mind flayer around." Instead, I decided to put together something a little less obvious, and I came up with Shivera. Shivera is a small white dragon born with extraordinary powers of the mind that even she doesn't fully comprehend. She might be the experiment of some deranged wizard or mind flayer, but she cares little. All she knows (and cares about) is that her ability to influence the thoughts of others is an advantage she relishes. 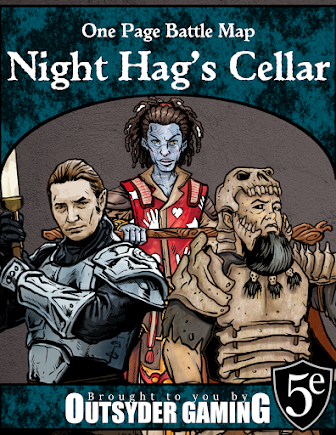 The head of a small band of kobolds, Shivera has invaded and usurped control of an elderly mage's mansion. Because the mansion was so secluded, its new owner has gone undiscovered until recently, when Shivera expanded her realm of control to include the mage's former apprentice, which attracted the attention of our adventurers. With the ability to control the minds of others, Shivera might be destined for greatness (more likely infamy) if she can avoid being killed before she matures. Outsyder Gaming won't be updated anytime soon except for the posts I've already scheduled because I'm keeping close tabs on my wife. For more info, you can click here. I will return to the blogging community when my wife's health improves. It isn't often that you hear about a really athletic D&D player or a professional athlete who plays RPGs. The two pursuits are stereotypically considered opposites. In fact, few people believe me when I tell them that the group of guys that I gamed with in high school was made up almost entirely of basketball players. Any real conversation about gaming also requires getting past a few "Seriously?" and "You're kidding!" comments every time I tell someone that I play D&D. I guess I just don't fit the mold. In any case, finding out that Tim Duncan plays D&D and has a Merlin tattoo put a little bounce in my step. It is always cool to find out that an athlete also enjoys the same game that I do, especially since he's an athlete that I've enjoyed seeing on the court since he played at Wake Forest just a few miles down I-40 from my hometown. I wonder how badly he wanted to be drafted by the Washington Wizards? What should I use for the arcane slaveholders? Note: I do realize that I already set up the ogre magi of the Barren Valley as slaveholders, but I want this organization to hit closer to home and provide plot hooks at early levels that might lead to confrontations with powerful beings later on. I also might use this organization as a difficult "lesser of two evils" choice for the party later on in the campaign, forcing the players to choose whether to deal with these guys or with the plot to merge the prime material with the Shadowfell. A little goofy, yes, but the Spore Creature Creator is a great diversion from life for a few hours. While playing around with it a while back, I wound up with a decent looking draconian creature. I might use this for a future NPC spotlight or perhaps generate some stats for these creatures at some point. For now, I'm just going to file it away in the idea library to be used at a later date. 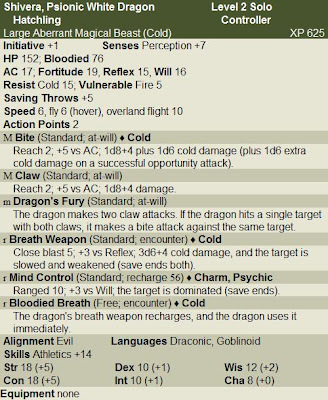 It might be cool to see how many classic D&D monsters can be created using the creature creator, but I don't have the time, energy, or interest to fool with the program that much. I'd much rather be writing or watching college basketball. It is March, after all, and we play Dook tomorrow at 4:00. 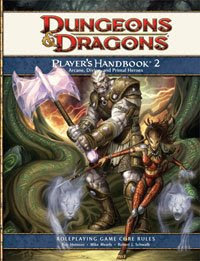 Although I haven't seen a physical copy yet (and seeing a physical copy sparks my consumer temptation more than anything), as of right now I have no intention of buying the Player's Handbook 2. Is it that I don't care what's in it? Do I think it is a poor product? Of course not. The previews have been pretty cool (especially the zealous assassin that I can use for an updated Darkmask). I just can't bring myself to shell out an extra $20+ for stuff I'll be getting with the next update of the Character Builder. Granted, I'm paying good money for that program considering I get little use out of the rest of my D&D Insider subscription, but if it makes me not want to buy the books, is it going to benefit Wizards of the Coast financially? I guess it will if the profit from my subscription payment is the same or higher than the profit they would have made from my purchase of the book, but it just seems counterproductive to me. I guess they'll make plenty of money on accessories that don't get 99% of their content added to Character Builder. Oh well. I guess it isn't really my concern unless they stop cranking out the accessories and updates. I'm taking a short hiatus from building the Shadow's Apex campaign setting today for a mini-rant and to ask some advice. I don't like game rules that make me think about nit picky mechanics when I should be thinking about the storyline or about my overall strategy in combat. The most glaring example I can think of that bothered me was the "choose an opponent each round" crap that was included in the Dodge feat in 3rd edition. There just wasn't a big enough payoff for the mental energy it took to remember to choose an opponent, not to mention the energy it took for my players to keep reminding me, "My armor class is 19 against that guy, but 18 against everybody else." It didn't take long to houserule the Dodge feat into a static +1 to AC that you lost whenever you lost your Dex bonus. In 4e, there was a deliberate attempt to remove rules, feats, and powers that were irritating in that regard. However, looking ahead a few levels, I foresee having the same gripe about the restriction on the number of item daily powers you can use (PHB 226). Right now, no PC has more than one or two magic items so this isn't an issue in the least, but I'm dreading having to keep up with (or reminding my players to keep up with) whether or not they can use an item power due to their tier and the number of milestones they have completed. I'm considering eliminating that rule completely ahead of time just to avoid the irritation. However, since no 4e campaign we have run has reached higher than 4th level (and our current campaign is only at 2nd), I don't have the experience with the system to know whether or not this will seriously unbalance things. For those of you more experienced with the system, has this rule been beneficial to you at all? Is it as big of a pain to keep up with as I think it will be? Does anyone else ignore it? Shadow's Apex Part 21: Where Are These Races? So far, we have a list of races and a map. Now it is time to make some notes about where the largest populations of each race live. You can check out the map here. Anesian Wasteland - According to legend, this land was once the home to a powerful human nation called Anesia. Some magical catastrophe caused the land to dry up and the survivors to scatter. Now the land is inhabited by nomadic humans and an outcast tribe of lizard men who left their marshy homeland for the desert life. Barren Valley - This valley was far from barren years ago, but it was overrun by a horde of orcs and ogre magi. Today, the barren valley is far from safe for anyone without orc or ogre blood, and the inhabitants support themselves by supporting a huge slave population (mostly human and half-orc). Bloody Bayou - Sages debate over whether this stretch of swampland was named after the red clay that gives the standing water a distinctive tint or the massacre that took place as Anesian refugees were slaughtered by lizard men as they fled the catastrophe that left their homeland in ruins. Coppervine Forest - Though the elves and eladrin who inhabit this deep forest have lived there for hundreds (perhaps thousands) of years, they still speak fondly of an ancestral homeland somewhere far to the west. They maintain a shaky peace treaty with the gnolls who also inhabit the forest, one that few outside the ruling bodies of each group fully comprehend. Drake's Hoard Mountains - Named after the dragon's hoard that supposedly rests somewhere deep in this mountain range, very few adventurers who have ever searched for it have returned to tell the tale. In the last few decades, exploring the mountains has been even more difficult than before because the Barren Valley stands between the dragon's hoard and most of civilization. Foothills - This long stretch of rolling hills isn't the home of any particular civilization. Instead, much of it is untamed wilderness with nearby nations spilling over into the rolling countryside. Garrotten - This small town lies south of Verge in the fertile coastal plains. It is a town of transient outcasts, mostly human but the home of a handful of nearly any race imaginable. Greengleam Valley - This valley is the secluded home of the minotaurs, and few would even know of its existence if not for the minotaur tradition of sending adolescents into the outside world for a few years before returning for their coming of age ceremony. Metsawood - A small untamed woodland compared to the Coppervine Forest to the south, the elves who live here are more reclusive than most and are considered little better than savages by the elves and eladrin of Coppervine. Pallid Sea - The sand on the beaches of the Pallid Sea is bleach white and especially fine, so much so that the slightest disturbance makes the water appear almost milky in color. Saari Isles - These islands are sanctuaries for pirates who prey on the populace of the coastal plain. Because commerce is slow, they specialize in kidnapping, ransoms, and the slave trade rather than the theft that supported their piracy when Anesia still held power. Saltmarsh - This town lies on the edge of the Bloody Bayou and surprises many natives of the region with its ability to prosper in the shadow of the lizard men of the swampland. Although the occasional skirmish is fought between the lizard men and the town militia, no one knows why the lizard men leave the humans and their allies alone. Twin Peaks - Aarakocra and kenku compete over these two towering peaks. Verge - This town is home to many of the so-called goodly races. Humans are the most populous, but many races can be found here, particularly in and around the marketplace. Vuoristos - Deep within these mountains, three dwarf kingdoms compete for resources. Aboveground, dragonborn inhabit the eastern side of the mountains and the orcs and ogres inhabit the regions bordering the Barren Valley. Eliat Greenflame was a DMPC that I ran in the Age of Worms campaign before a TPK and the excitement of 4e stopped us from completing it. As I have said before, I'm a big fan of optimization, and this guy is no exception. He was, however, mainly a support character, so no matter how efficient he was, he rarely stole the spotlight because his niche was improving the rolls of the other characters and saving their behinds with healing (because the party didn't have a cleric). The stats reflect Amras just before the session in which he and the rest of his companions were killed. Eliat began his career as a happy-go-lucky minstrel, silent except when cracking jokes. He had always paid lip service to Tymora, thinking that her good luck coupled with his good looks would get him through whatever life threw at him. However, when he began discovering clues that the Age of Worms was at hand, his faith took on a little more substance and he devoted more of his time to perfecting his magical and musical craft as well as seeing to it that his fate in the afterlife would be assured. Later in his career, Tymora informed him that it was his destiny to assist the heroes who would strike back against the minions of Kyuss as a member of the fellowship of the jade phoenix (replacing that souldrake monstrosity mentioned in the flavor text with Kyuss to better tie him into the storyline). To download full stats, click here. Last week was rough, and I didn't get to devote nearly as much time as I intended to blogging (or gaming at all, for that matter). But the weekend was a little less hectic, so I present now an updated map of Vidarr. I cannot, however, claim to have named these locations on my own. 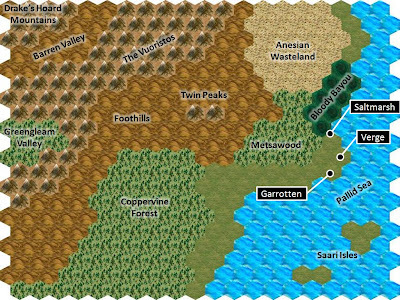 Saltmarsh and Garrotten are classic D&D locations. Most of the non-English words are actually Finnish, courtesy of Google Translate. The rest I either created or stole from a great landscape name generator on Seventh Sanctum.